With the 2015 Michelin Guide hot off the press only last week, a look at one of the UK establishments with a star seemed appropriate. I have a bit of a love hate relationship with Michelin starred establishments. Some are chilled out places where the chef’s love of food shines through and the food does all the talking. Others, to me, seem to regard themselves as temples of gastronomy where we are meant to go and pay homage to the chef and boy do you pay. As a result they are so pretentious that they are in danger of disappearing up their own backsides. I love El Portal in the beautiful village of Ezcarey in La Rioja for its stylish informality (I didn’t feel under dressed which I can tell you means it is very laid back indeed) and its genius cooking which heavily exploits the stunning local bounty on offer. On the other hand, I hated the (now closed) La Table de Joel Robuchon in Paris which looked down its nose at me because neither Mrs.SF or I were dripping in designer wear and diamonds. They made us feel like the Clampetts from the Beverly Hillbillies. I thought at first I must have trodden in something but on checking it dawned on me that to the waiter I was the something !!! I was expecting him at one point to explain to me how one uses a knife and fork (him assuming, because I didn’t have a Patek Philippe on my wrist, that I was an oaf who would normal eat everything with my hands or simply fall face first into the food and start to chow down)!! I ended the meal with a burning desire to punch his supercilious face in. I can vividly recall every part of each meal I have had at El Portal. I have been a few times and will go back many more. Can’t recall any of the dishes at La Table de Joel Robuchon. 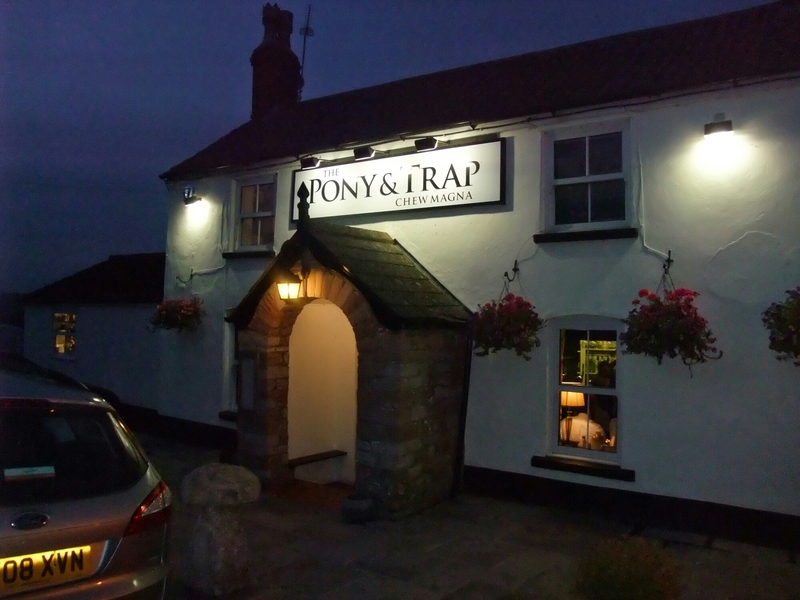 From what I had heard, the Pony & Trap near Chew Magna, Somerset seem very much at the right end of the Michelin star scale for me (chilled out, not too pricey and above all dishing out great food). 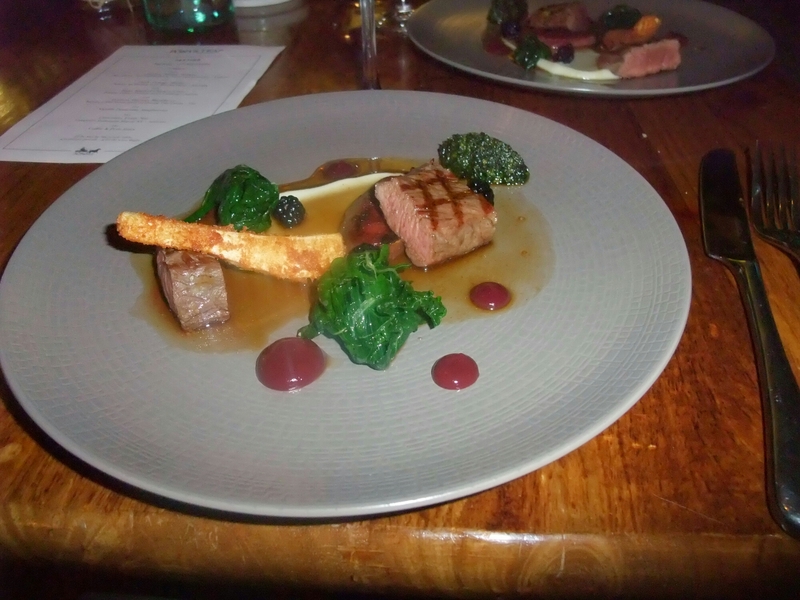 I have been keen to try the place ever since I saw the chef proprietor, Josh Eggleton on the the Great British Menu and Mrs. SF’s birthday presented me with the perfect excuse to go, especially as I thought it was a short drive for my sister who gave us a lift there and back from her place in Somerset (it wasn’t). Having booked a couple of weeks in advance I spent an unheathily large amount of time drooling over both the al a carte and tasting menus on their website. Both suggested food just up my street. On arriving, the place looked like a normal (albeit rather handsome looking) country pub. The views are apparently spectacular, but alas it was dark so I cannot confirm this. As we walked in the relaxed country pub (because that is what it is) feel continued with a bar on which there were some nice looking draft beers including the rather lovely Butcombe (a personal favourite having grown up in Somerset) bitter. The place was absolutely packed and we had to wait by the bar as a large table was served some very good looking food that smelt wonderful. 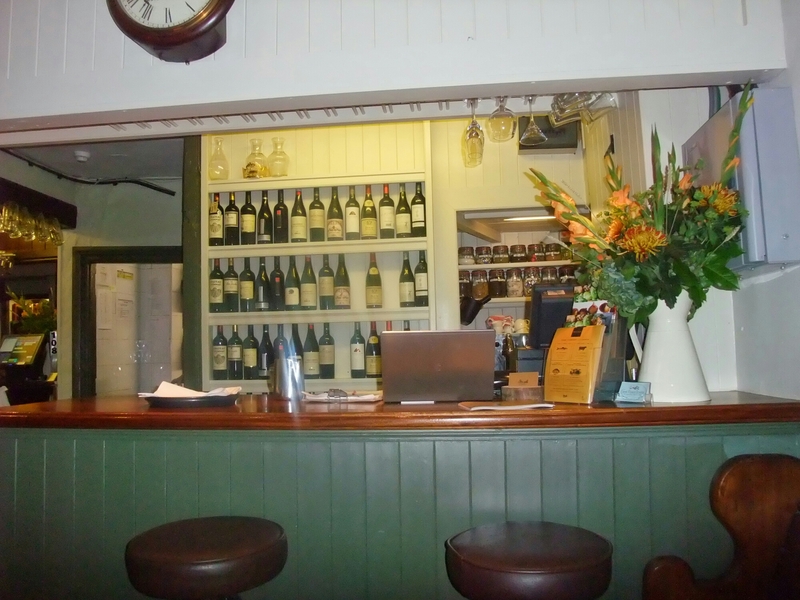 We were shown to our table in what I would regard as the snug and provided with both the al a carte and tasting menus. Both were chock-a-block with stuff that got the juices going, but whilst tempted by the Home Front Ration Pack (one of Josh Eggleton’s dishes on last series of the Great British Menu) and the Grouse (which I love) on the al a carte menu Mrs. SF and I were always going to go for the tasting menu (£60 a head + £25 for the flight of wine with it). I love tasting menus as it is the kitchen’s chance to show off and you get to see the full range of the brigade’s skill. The dishes on this one (albeit briefly described) pressed all the right buttons for me and Mrs SF. An aperitif in the form of a nicely chilled manzanilla got the evening off to a good start as the first of the canapés arrived. A bottle of water appeared unprompted and was replaced when we had drained it. I like that. 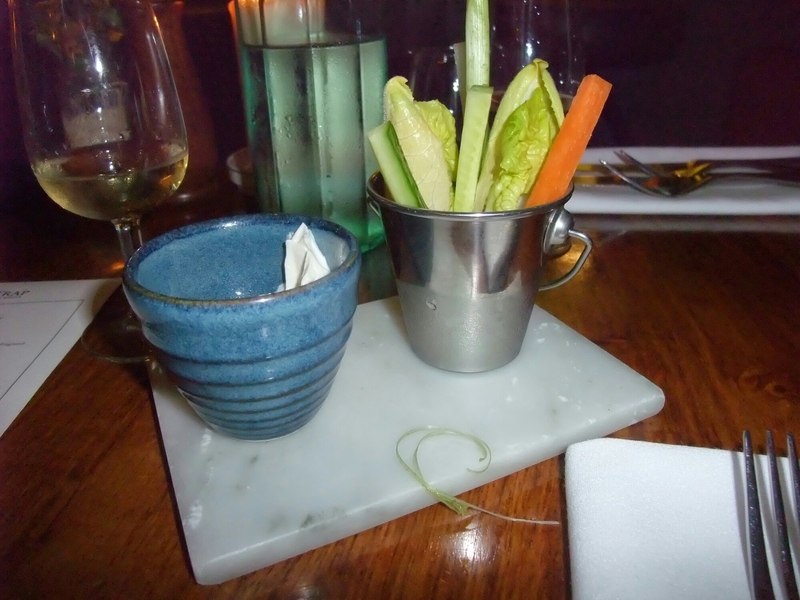 The first of the two sets of canapes were some locally grown crisp raw vegetables (carrot, spring onions, cucumber and lettuce leaves) that were as fresh as a daisy (they could well have been picked that day) and tasted of what they were in spades (veg. these days rarely does). They came with a pot of nicely flavoured and subtly smoked fish roe dip. This was about as far away from the radioactive pink taramasalata you usually see as you can get. The flavours in the dip complemented rather than overpowered the veg. A simple, but delicious dish where the raw ingredients did all the talking. Next up was a set of spoons, one with a beautifully sweet scallop tartare and the other a lovely beetroot and ewe’s curd combo. Both were lovely, but the earthiness of the beetroot as against the creamy curd stole the show. 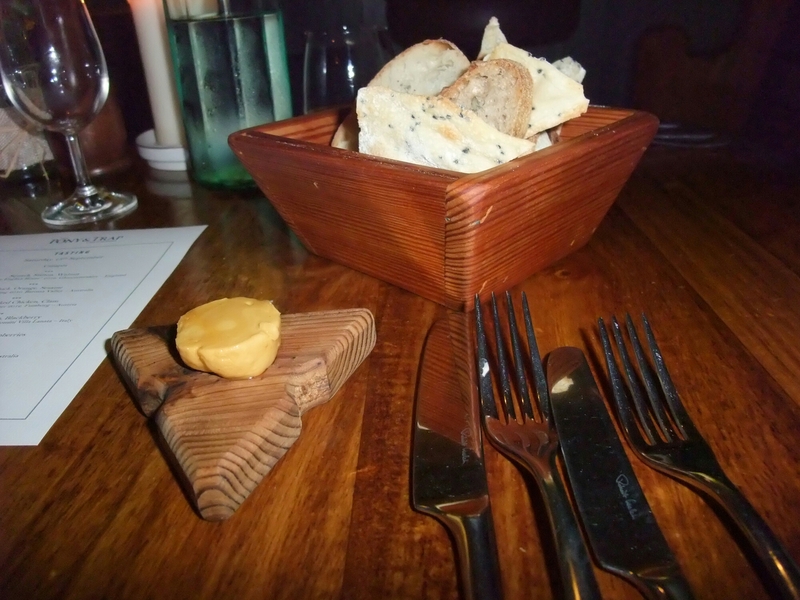 A decent sized basket of good bread (white, brown and flat bread) was delivered to the table with a pat of “devil” butter. This, we were informed, was locally churned butter to which mustard, tabasco (I think) and marmite had been added. It was a work of genius which I shall be attempting to replicate at home and my only complaint was the pat wasn’t a massive slab of the stuff. If I am honest I could have happily eaten it without the bread (nice as it was). This simple descripton (a theme thoughout the menu) belied the complexity of the flavours and textures present in this dish. Butternut squash, roasted to a point where it retained a little bit of bite as well as puréed, with a real intensity of flavour to it. Added to this was sweetness from an apple compot, saltiness from a gooey stilton rarebit and nuttiness from pumpkin seeds and walnuts. 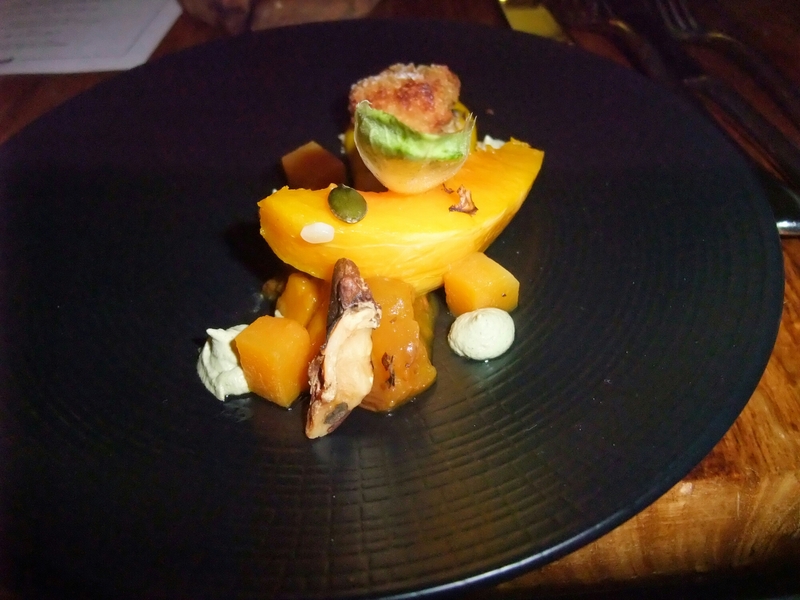 A beautifully balanced dish, which Mr.SF described rather aptly as Autumn on a plate. The wine with this course was a very pleasant English white ( “The England House” 2012 from the Three Choirs Vineyard in Gloucestershire). This wine had lovely floral notes, including elderflower, and worked brilliantly with the food which really seemed to add a further dimension to this wine. 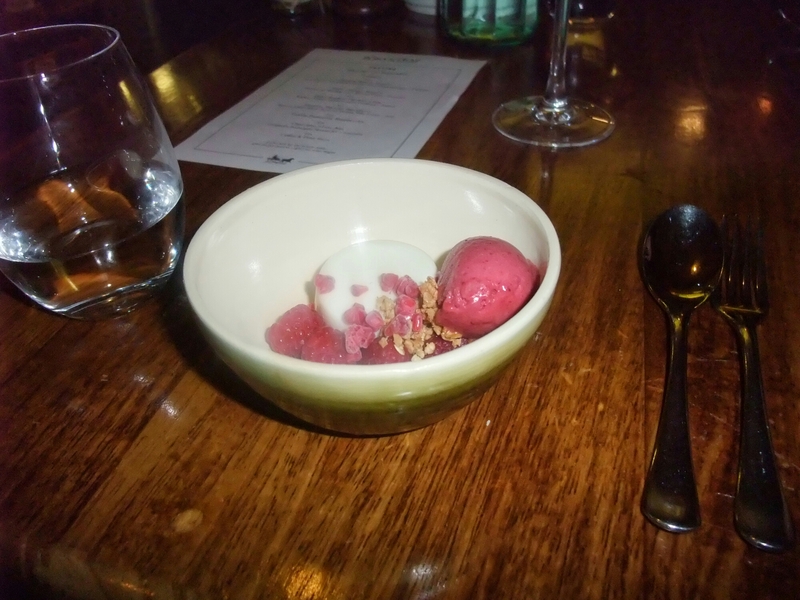 This dish was served to us by the chef, Josh Eggleton, who as far as I could see was very happy to muck in with the waiting staff. He explained the provenance of the Aylesbury duck in the dish and that it was lightly cured (for a day), with the skin taken off and cooked to a nice crispiness (the skin that is). Added to this was a lovely rich duck liver parfait This dish had a lovely Asian feel to it due to spicing and the addition of beautifully thin and crispy shards of sesame toast. The orange element, a classic accompliment for duck, came in the form of intensely flavoured segments and dots of a spiced orange reduction. This dish was as pretty as a picture and packed full of flavour. 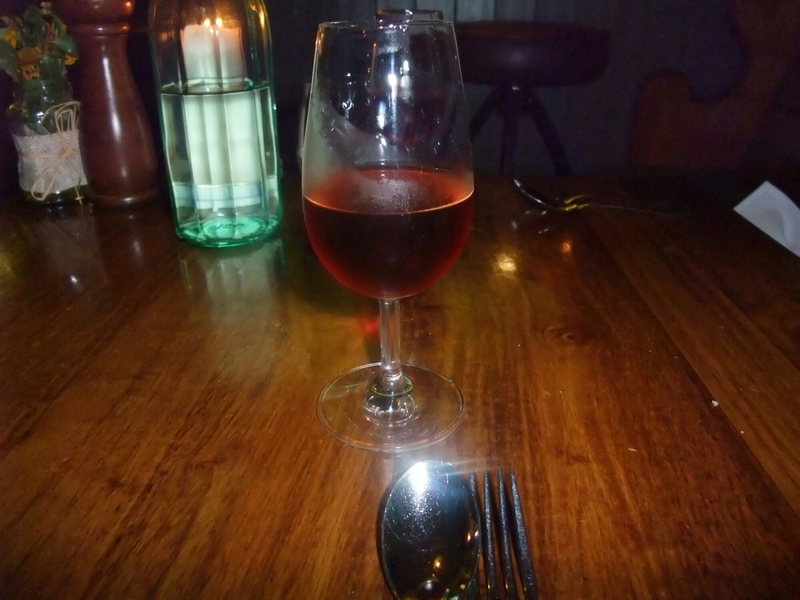 The wine pairing was an Aussie riesling from the Barossa Valley (Bethany g6 2010). This has a nice whiff of petrol (classic riesling aroma) on the nose and bags of lime on the palate. 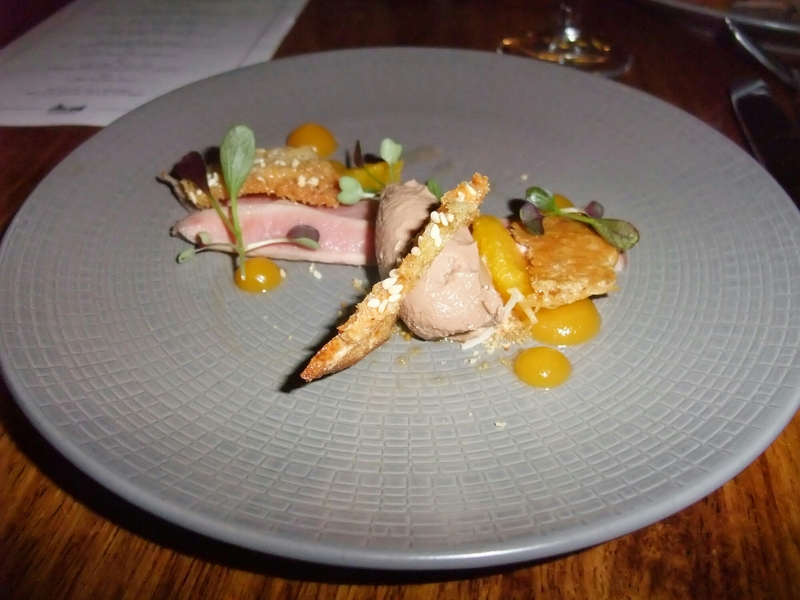 A great match for Asian flavours in the dish, it also worked really well with the richness of the parfait. 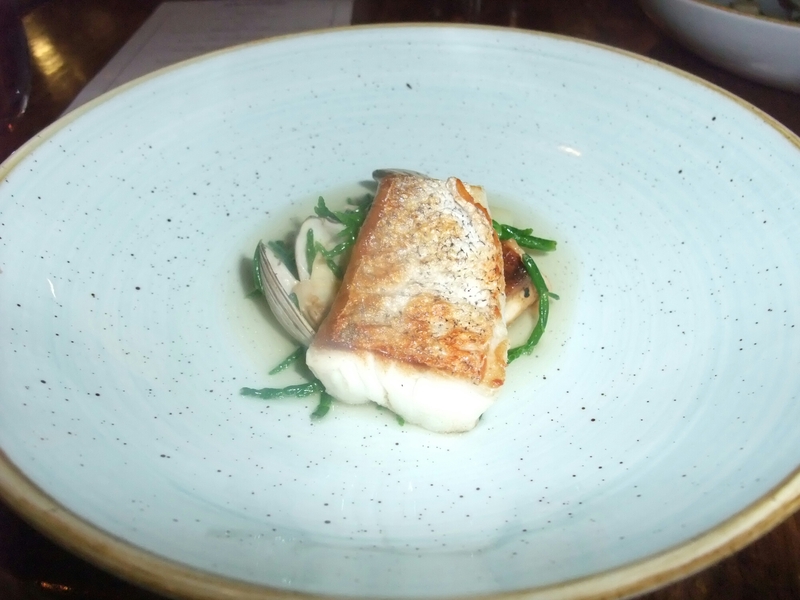 This course was explained to us as also coming with samphire and a bacon broth and my initial thought was would the strong flavours of the bacon and smoked chicken simply overwhelm the delicate hake and clams. These concerns were unwarranted as all the flavours married quite beautifully. The small piece of hake was perfectly cooked with a lovely crisp skin . The bacon broth was intensely bacony whilst the smoke on the chicken was just right. It takes a lot of skill to bring these flavours together without some being overwhelmed. Here the result was a beautiful dish. Wine wise this was a tricky dish to match and they opted for that brilliant food wine, Gruner Veltliner (Soellner 2012 Fumberg, Austria). This had enough body not to be swamped by dish and its white pepperiness adding nicely to the mix. Next up was perfectly cooked venison, with a ruby red core. This was accompanied by a parsnip puree and a crispy coated parsnip. Added to this was the meaty beefiness of a lovely bit of slow roasted ox tongue, the sweetness of blackberries and some iron rich greens. A nice dish which took advantage of locally sourced and seasonal ingredients. The wine chosen to accompany this dish was a Barbara D’Alba (Sucule 2009\10, Domini Villa Lanara) from Italy. The sour cherry flavours here worked as a nice counterpoint to the sweetness of the parsnips and blackberries. Last dish of the night and I forgot to take a photo (sorry) of what was my least favourite dish. Whilst still very good, it was a bit too rich for the end of the meal (at least to me, but am sure many would disagree). The really good bits were a lovely malted milk ice cream, an excellent hazelnut tuille and a blot of toffee like hazelnut butter. The chocolate element was a rich sort of ganache square (but more runny). I cannot for the life of me recall the fruit element. This was paired with a Campbell’s Rutherglen Muscat NV, a lovely figgy Australian stickie that worked well with the rich chocolate. 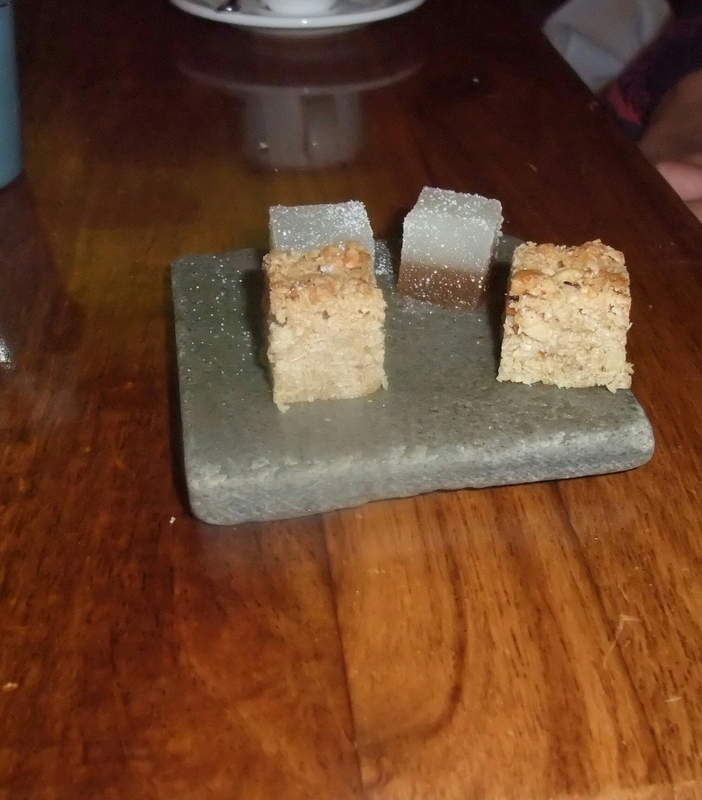 We finished off the meal with coffees (me a filter -a tad weak for my tastes – and Mrs. SF an espresso – just right) and some excellent petit fours in the form of peanut butter flapjacks (good) and some beautifully zingy jelly cola cubes (blooming lovely). Nice to see coffee was included, as when Mrs.SF and I had the nice but very pricey tasting menu at Asador Etxebarri in Pais Vasco, Northern Spain last year we were more than somewhat aggrieved to find when the bill arrived (with a thud) that coffee was extra. Service was efficient and friendly, with the meal being nicely paced. A special mention should go to the sommelier who came over and explained each wine to us and why it had been paired with the course in question. She clearly loves her job or is a bloody good actor and her enthusiasm for the wines and food was infectious. 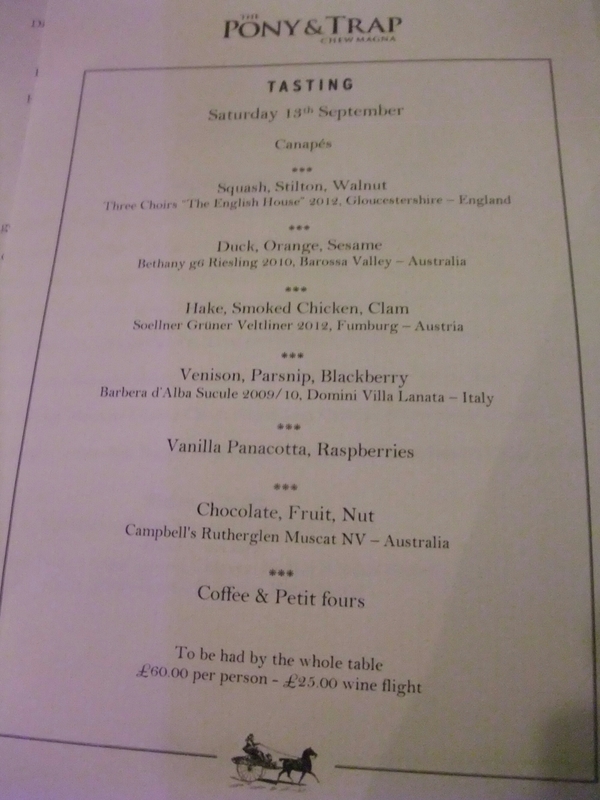 The damage, with pre-dinner drinks and both Mrs. SF and I taking the wine flight option, was £177 (without tip). Certainly not cheap but I thought for the quality it was good value. I have paid a lot more for a lot worse. 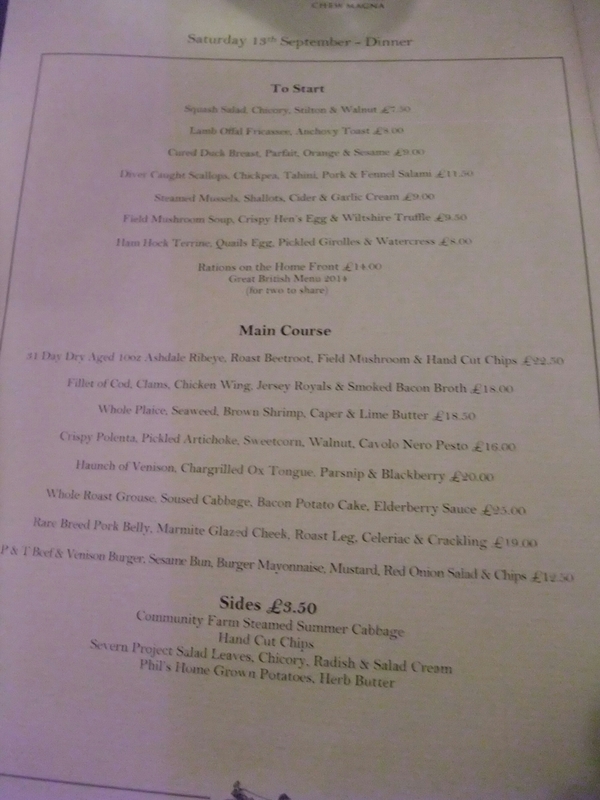 Very good value can also be found in the al a carte menu where starters ranged from between £7 and £9 and mains between £16 and £25. For Michelin star cooking this is very reasonable pricing. Wine wise (usually a killer on the cost front in Michelin star establishments) the list was again pretty good value, with plenty of stuff of interest below £30 and even a fair few under £20 and a good number of decent wines by the glass (always nice to see). Not a list to perhaps thrill oenophiles, but nice enough and good value. 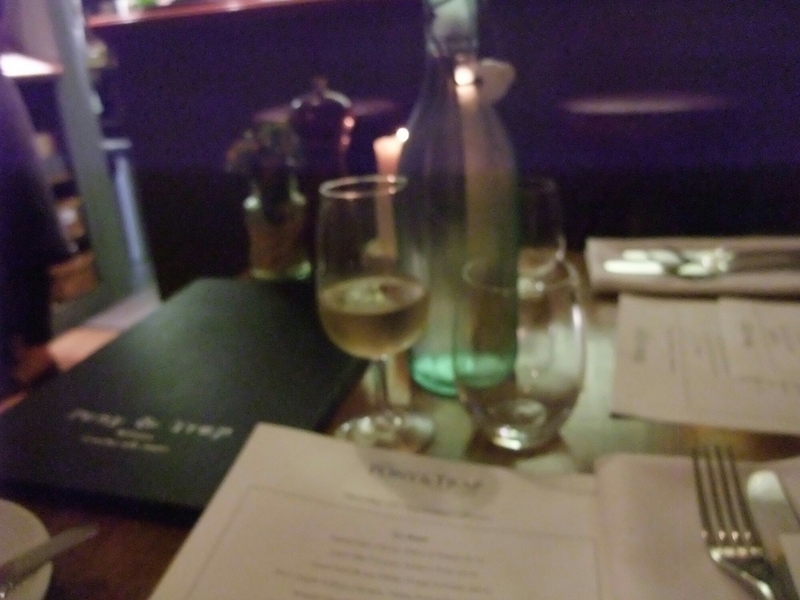 A beautiful meal with some lovely wine pairings and a relaxed, informal atmosphere made for a very happy birthday meal for Mrs.SF. This sort of stuff always makes me happy. The combination of local seasonal ingredients, skillful cooking and beautiful flavour combinations made this a meal that was a joy to eat. The dish of the day for both Mrs.SF and I was the hake, smoked chicken and clam dish. It could so easily have been a train wreck and probably would have been if tried by a lesser skilled brigade. Here it was just fab, with all the flavours working together yet holding their own within the whole. Would I go backed? About to book for my Mum’s birthday next month, so that is a most definite yes (with bells on it). Interestingly it is only 6 miles from Bristol airport – ooh lunch before a late afternoon flight out or after a late morning flight in. Now that would be a great way to start or end a holiday. Nice to see this week it retained its Michelin star. Richly deserved. All in all a great little place. 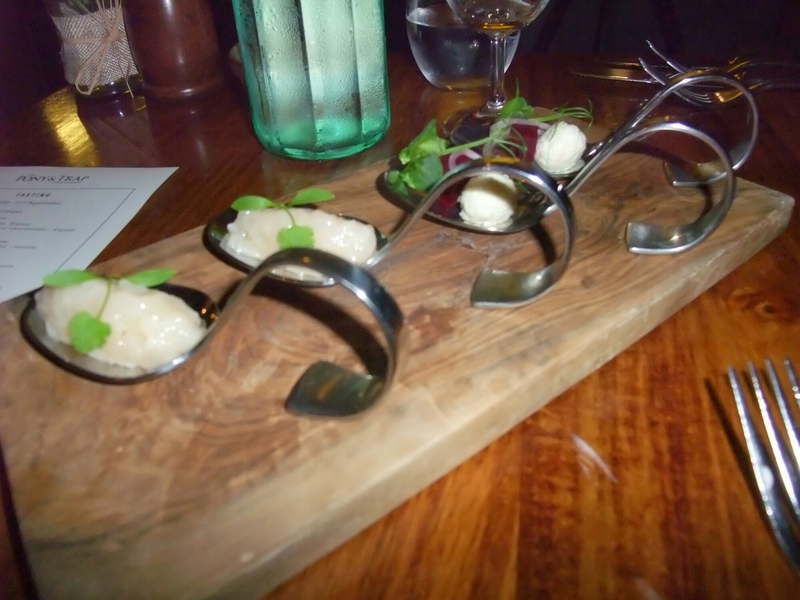 This entry was posted on Sep 28, 2014 by solicitingflavours in Alcoholic drink, Bristol, Country pub, Drink, Fine dining, fish, Food, Food and wine products, Michelin star, Outside Wales, Pub near Bristol Airport, Restaurant Review, Tasting menu.